This super cute Sight Word Easter Chicks activity is a fun way for kindergartners to practice sight words with a cute activity that is Easter educational. Kids are fascinated with Easter chicks! This activity draws on that natural interest to make it Easter educational! Young learners will build chicks by working on sight word reading fluency. Print these mats, add the kindergarten sight words you are working on to the chick cards via the PowerPoint file, save as a PDF, print and you’re set to go! This activity is super easy to set-up. Simply print the pages in color. Then I recommend you laminate the pages for durability. Finally, cut apart the chicks and you are ready to practice kindergarten sight words – or any other sight words you’d like to practice as the free printable is EDITABLE! Print as many mats as you need for the number of students in your class – the same goes for the sight word printable chick cards. You can add LIMITLESS amount of sight words to your file. Just make a copy of the same PowerPoint slide you’re working on and edit the words on the slide. Be sure to save the file as a PDF so that printing is seamless. I LOVE using learning mats – they are so much fun for kids and best of all, they are quick to setup and play! Use these mats to help kids learn to read and identify their sight words. We know that with learning, repetition and practice is key. Kids will be motivated to ‘build their chicks’ as they read and match sight words. You can work on ANY sight word list you want since this file is totally editable! After you’ve printed and laminated the cards and the mats, cut the sight word ‘chick’ cards on the guide. Place the sight word cards along with the mat on the table. 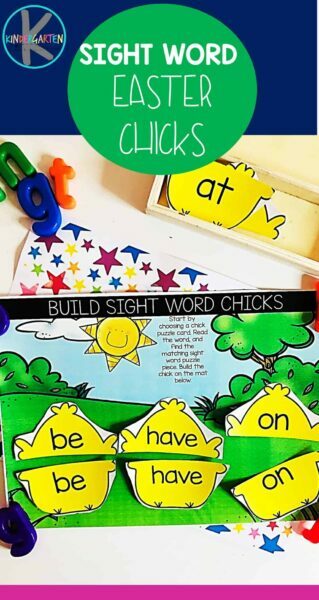 Have the kids start by choosing a chick sight word card, read the sight word on it and then find the matching piece sight word card to build their chicks. They can build up to three chicks on the one mat. You can of course, print this mat on a larger A3 sized poster paper to have them build even more at once. Make practicing letter recognition fun with these adorable Free Easter Color by Letter worksheets perfect for preschool and kindergarten age kids for some Easter themed learning activities.